A handheld tie-in for BioWare's upcoming sci-fi RPG will help players prepare for the Reaper invasion. Folks, if you were angry about Mass Effect 3 having multiplayer, you may want to sit down; this next bit of news might break your heart. BioWare has previously hinted at a handheld component for the final installment in its space opera RPG trilogy, but other information has been sparse. 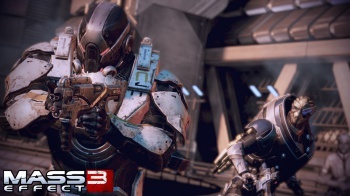 Now, a few new details have revealed a few choice bits about the mobile Mass Effect 3. The game appears to be aimed at smartphones rather than traditional handheld gaming systems, and will tie into Galaxy at War, the cooperative mode in which players will team up to protect the far reaches of the galaxy from the invading Reapers. Given that Mass Effect 3 is only five weeks away, BioWare's comments on the matter seem unusually vague. "There will be "handheld/mobile" products tied to Mass Effect 3," states an EA representative. "They are part of the Galaxy at War system. We will have more details to share soon." This isn't much information to go on, although it is the first time the company has confirmed that the mobile game and will focus on Galaxy at War as opposed to any of the other myriad stories in the Mass Effect universe. Dedicated fans may remember that this is not Mass Effect's first venture into handheld territory. Prior to the release of Mass Effect 2, iOS users got a sneak peek at party members Jacob and Miranda in the thoroughly forgettable Mass Effect: Galaxy. While it wasn't anything special, it did have nice artwork and changed a tiny bit of dialogue Mass Effect 2 for players with linked accounts. It's not unreasonable to think that Mass Effect 3's tie-in may be a little more ambitious and hold greater rewards. Now that a few years have gone by and the handheld market has opened up considerably, BioWare has a second chance to show players that Mass Effect doesn't need a powerful platform to deliver an engaging experience. If nothing else, the upcoming app shows that BioWare is serious about promoting Mass Effect 3's multiplayer capabilities. The only question is, will saving the galaxy be as much fun if Commander Shepard doesn't have to do it alone?